Need for relatedness, which is the sense of being cared for and connected to other people. Group identity seeking: the desire to belong to a group, as well as the tendency to favor members of your own group. Does this seem about right? Any additional views or improvement suggestions are welcome. These, to me, seam a little bit mixed-up. Status seeking and resource striving are (to me) both strategies to fulfill the need for POWER (control the environment). Fairness and reciprocity are deep human needs stemming from the need for Interdependence. Another thing worth pointing out is that deep needs are often obscured. We are not in touch with the need but we get the benefit (pleasant feelings) when we fulfill them. Reconnection to the deep needs through awareness might be a huge motivator. Thanks for these thoughs, Peter! There are many competing lists of basic drives, needs, ultimate motives etc. For instance, yesterday I heard someone - Paul Lawrence- mention: 1) the drive to acquire resources and enhace our status, 2) the drive to protect what we've got, 3) the drive to bond in long term caring relationships, 4) the drive to comprehend and create. If you want to research into "needs" I think that one of the best places you could look is Nonviolent Communication. Needs are about 90% of the NVC process. The main benefit in studying NVC is their guidance into becoming aware of the difference between NEEDS and FAUX-NEEDS. Often, we confuse strategies with needs. When we do this, we risk ending up attached to a particular strategy without being aware of the need behind it and, thus, without being aware of the alternative strategies to fulfill that need. The easiest examples are relationships. We all have a need for love. A need to love and be loved. However, a particular person is simply a strategy to fulfill that need. We might have a preference for a particular person to fulfill our need for love BUT we don't NEED that person. Anyway... to me, this is a very complex issue. I think that this approaches the limits of human expression. Language might be poorly equipped to express the reality we have at this level. We might be as the blind men describing the elephant. To give you another personal perspective, I think that the needs that motivate people might be modulated by personality and thus, we could have common needs but we might give more importance to some of them. For example, my need for power is very low, transcendence on the other hand is very high. All these differences mean that people end up saying something and understanding different things. For example, positive psychology research on relations point to the famous triad: aid, comfort and acceptance BUT, what I consider aid might be considered arrogance by someone else, what I consider comfort might be considered domineering and the things that are acceptable for me might be completely unacceptable for someone else. Thank Peter. No problem that the comment was long! Could you send me references to the research into needs done by NVC researchers? While I do believe that people have natural needs or drives I am a bit skeptical about the usefulness of asking questions like: "What do you need?". I am not sure this type of question is needed, whether it can be answered well by the person and whether it is helpful at all to come to an answer. It seems like a detour to me when compared to the SF process. In SF you ask: "how would you like your situation to become? "(or something comparable). That the answer to this question will reflect something like the basic needs of for instance autonomy, competence and relatedness is to be expected. But I think it is not necessary or useful to make this explicit. In fact, I think it will distract the person from describing his desired situation. So, while I recognize that the level of needs is an insight into what drives people I am skeptical about the usefulness of following a route via this insight to solutions. SF goes straight from the desire for change to the description of the desired situation which I think works better and faster. There used to be a huge research folder maintained by (if I remember correctly) Tom Caruso. Unfortunately, it is no longer available. I understand how NVC looks like a detour compared to SFC approach. I think this is because they have different objectives. Also, there is an antagonistic approach in certain areas. For example, SFC, to my understanding, uses the client vocabulary, phrasing, etc. In NVC this is bypassed and an attempt to connect to the feeling and needs of the person is made. The question "What do you need?" is useless in both approaches. In NVC is considered "psychoanalyzing jackal" (jackal being the antagonistic approach to compassionate "giraffe" communication). To give you an idea, in NVC the feeling and needs are guessed not interrogated. This is done because few people are in touch with their own needs and feelings. I recently watched an intermediate training session on NVC called "Making Life Wonderful". It's about 8 hours long (taken from a 2 day workshop) and consists mainly on practical role-playing. It is amazing to see the shock people have when they realize that they are not in touch with the needs present in that specific situation. This disconnection from the needs perpetuates the violence because without connection to the needs, most people tend to default to the violent "who's right" game. Yes! I can confirm this difference. NVC focuses very strongly on the present. The emphasis is on understanding the root (needs). Are you aware of the work of the late prof. David McClelland (Harvard)? He refers to the three human social needs nAFF - the need for affiliation (ie. relatedness), nACH - the need for achievement (ie. competence) and nPOW - the need for power or influence (relates to autonomy). May be helpful. dear Kees, within self determination theory the work of McClelland is wel known. The basic needs with SDT can partly be seen, I think, as an update of the McClelland model. I'm not so sure that it makes much philosophical sense to go for a "general theory of motivation for everyone". People strive for stuff. Different people in different environments will want different things. Ok, one use of finding out what most people want is that you can make more people happy (if that's what you want), but then you get into the whole utilitarian debate. hm. will think some more, very interesting stuff!Thanks for sharing! I am not sure either whether it is useful to design a general theory of motivation which is universally applicable. But I do think it is. Crucial in this I find the following idea. Knowing that all us need certain things and have certain tendencies may help us work from these assumptions when working with individuals. But not necessarily in an explicit way. In other words: I don't think it is necessary or useful to discuss the (for instance) need for competence of people in the sense that you'd have to say things like: "You need to feel competent, don't you? "or "All people need to feel competent, and so do you. Now what can we do to make you feel competent?" These types of interventions would, I believe not be likely to be useful. More indirect and subtle interventions, however, which would also be based on the knowledge that all of need to feel competent might be very useful, however. And I think they are. An example is to use process compliments which are sense of competence enhancing. So, Yes i do believe knowledge about generic human tendencies, drivers, motivations is useful. But, no, this does not mean this knowledge should be explicitly discussed in the conversation with the client. Rather it could be the foundation of the subtle interventions you use. In addition to this, I'd like to remark that caution about any general claim about anything within the psychologcal or social realm must be met with caution and skepticism. For certain 'drivers' a reasonable good empirically supported claim can be made that they are universal (the three SDT needs for instance), other claims are much more doubtful and/or may me more mutable, I think (for instance perhapsm the need for power of the need for certainty). I think it's a really interesting discussion but I don't agree that autonomy and competence are comparable to resource and status striving. Resource and status striving are external motivators and I (and SDT) would argue not inherent needs as autonomy, competence and relatedness are. As I'm sure you know, Coert, there has been considerable empirical research to support the suggestion that children are born without an inherent desire for material gain but that it is interactions with the environment over time that lead to a desire for the material. If you took SDT down to its basic theoretical roots you could say that an individual left to their own devices, without the pressures of a material society, would thrive by fulfilling the needs for autonomy, competence and relatedness alone. I also think it is very important distinction between basic psychological needs and behavioural drivers/desires/goals. Thank you for your comment! I like your explanation. It was precisely the type of response I was hoping to get. I'm also interested in Bex's answer. I view the distinction as the distinction between needs and strategies (faux-needs). Strategies as faux-needs are implanted in our minds by society. having a few assumptions about what generally motivates people might indeed be useful for a conversation that intends to help people move from where they are to where they want to be, you are right! Philosophically, I don't think that much of a distinction can (or should) be made between "innate" and "developed". Our minds and emotions are the result of our interactions with others and with Wittgenstein and Harré I don't assume that it is useful to assume a "mind behind the mind" that is filled with unconscious mechanisms such as "needs" and "drivers". I also agree about being cautious with traditional psychological research -- but I think there is a lot going on at the moment. My hunch is that we can use more of psychological research than we think -- I guess it needs a philosophical translation. Thanks! You response triggers some thought with me. I think I largely agree with your remark on the distinction between innate and developed. I believe the nature-via-nuture model which rejects genetic determinism (see for instance http://bit.ly/91euuO and http://bit.ly/clrnFZ). On the topics of assumptions and theories: I think we all have all kinds of assumptions and theories but they are often implicit. I think often our actions and choices are based on implicit views, assumptions, and convictions without us realizing it. I am arguing for trying to make the assumptions explicit and testing them. Some of them may be valid and others not. What we think is true and valid is not necessarily so. Once we learn about the validity of our views and assumptions we can try to refine them, which will, of course, be and endless process. My thoughts on psychology: I think part of psychology is a bit old fashioned in certain ways. For instance I have written a few slightly critical posts on positive psychology: http://bit.ly/hquGuw. Psychologists sometimes (too often) still are prone to the psychologist's bias (see here http://bit.ly/ecej0M and here http://bit.ly/gY3M0s) and choose their criterion measures too narrow. Yet, many psychology researchers are, I think, doing fantastic work (Carol Dweck, John Bargh, Anders Ericsson, Josh Aronson, Richard Ryan, Edward Deci, etc). I think, in my mind (and I am heavily influenced by SDT being that it is the basis of my PhD) the satisfaction of basic psychological needs is necessary for optimal functioning - an environment which supports autonomy, competence and relatedness is likely to bring the best out in people. I would then draw a distinction between goals and desires which are a product of our interactions with our social contexts. Put crudely - if a child grows up in an environment which emphasises external reward and punishment, they are likely to develop a desire (manifest in goals) towards material gain and the avoidance of punishment. If a child grows up in an environment in which they are encouraged to make their own choices, given good quality feedback and feel connected to the world around them they are more likely to seek out enriching goals which will continue to fulfill those needs. Does that make sense? I think, essentially, I see basic needs as innate and desires and goals as learnt. The learnt desires can support the basic needs or they can be destructive. Thank you Bex for your explanation. I agree with you. I do believe there is quite a bit of empirical evidence for the idea that the satisfaction of basic psychological leads to positive cognitive, affective and behavioral outcomes. thanks for the elegant explanation of the distinction between innate needs and goals and desires which have developed. I think it does make a lot of sense. I have a suggestion for the table that puts the needs on the vertical axis and the forces on the horizontal. Is shows the need for competence as a competitive force. The need for competence is defined as "the perception of being effective in dealing with the environment." If I want to be effective in dealing with the environment, I can do that either in a competitive or in a cooperative way. In some situations I need to compete to be effective, in other situations I need to cooperate to be effective. So I would check all four boxes for the need for competence. Looking at your chart, I wonder where would fit this basic-basic need of people to feel accepted and allowed to live, even. There is no need to feel accepted. "Allowed to live" might fit also there or, if taken literally, fits the need for physical safety. Interesting discussion. Especially if and how there is an added value for the SF-approach in f.e. coaching and teamdevelopment. I'm so free to give some food to this discussion. Since 10 years I'm working with Spiral Dynamics (SD): a theory and 'way of thinking' developed by the humanistic psychologist Clare C. Graves and builded out by his followers Don Beck and Chris Cowan. Spiral Dynamics really changed my way of looking at individuals, teams, organisations and... the world. SD is a so called Dynamics Evolutionary System, which shows and proves that in human development (±last 100.00 years) a number of valuesystems (levels of human existence) emerged in reaction on (changed) lifeconditions. A new valuesystem most times emerges because there is an urgency to change the way of thinking and doing in order to survive. New systems transcend and include former ones. So a lot of people have entrance to most valuesystems, but the prefered order and intensity vary. A Valuestest can make this 'profile' visible. Each valuesystem is a 'logical' worldview, with its own principles, needs, opinions about good and bad, truths, etc. More recent systems are not better or worse, but can better handle complexity, which is adequate if lifeconditions ask for this. Turquoise: WholeView - synergize and macromanage. There is a lot more to tell about SD and in someway needed for a right understanding and a 'fair use'. Just Google and be surprised. I also often use a dedicated system based on SD,'Management Drives'. If you wish, you can easily relate systems as SDT and Scarf to SD. 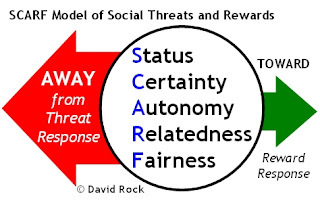 'Autonomy' relates to red or orange (both 'competitive forces'). Competence relates to blue and orange and relatedness matches green and purple (both 'cooperative forces'). I use SD to connect on my cliënts 'profile'. In language, approach, workforms, dynamics, etc. and in my experience it is very helpfull. Do you incorporate this kind of dimensions in your SF-practice? What is your experience? Hello Gertjan, thank you for your comment. Indeed, it seems that there is quite a bit of overlap between SDT and Scarf and SD. Is there empirical research done by spiral dynamics authors? Hello Coert. There is a lot of empirical research and a lot of empirical experience. Graves started with questions to and observations of his students and extented that to several groups, countries and cultures. He did 20 years of research and made his first scientific publication in 1974 in The Futurist. (Books about the basics: Levels of Human Existance by Clare C Graves. ISBN 0-9724742-0-X / Spiral Dynamics; Waarden, leiderschap en veranderingen in een dynamisch model by Don Beck, Chris Cowan ISBN: 90 6963 639 5 / The Never ending quest by Cowan/Todorovic). Ken Wilber integrated SD in his Theory of Everything and motivates this in: A Theory of Everything ISBN 1-57062-855-6. Together with Don Beck he created Spiral Dynamics Integral (SDi) See wikipedia. There is a growing stack of (scientific) authors that integrated SD or SDi in their models. Some examples: Richard Barrett: Building a Values-Driven Organisation; Peter Merry: Evolutionary Leadership; Paul Zuiker/Wilbert vd Leijden: Nederland op doorbreken; Steve Macintosh: Integral Consciousness; M. Kuhlmann/B. Hoogendoorn: Implementatiekunst. Besides this SD is practically used in numerous countries, places and fields. Google and/or HumanEmergence.org tells you more if you like. Dear Gertjan, Thanks for your answer. Through google I will have a look at the resources you have mentioned. This is an interesting exercise. Coming back to your original question. Have you missed a link between relatedness and status? Do you not have to ask status in relation to whom? A sense of superiority is still a relationship because you have to be superior to someone. Similarly, might there not be a relatedness element to resource striving? Some resource striving is absolute and may be linked to basic survival drives. However, there's quite a bit of research that satisfaction derived from material possessions is relative. It's not that you have lots of money, it's that you have more than people around you. If I'm right, this would mean that relatedness has a finger in all of the pies. There could be a plausible explanation for this. At the start of our lives we ar entirely dependent on our parents for our survival. Relatedness (or the dependency element of relatedness) is, therefore, the first need we become aware of. As we start to gain control of our bodily functions, our attention is drawn towards the need for developing competence. At this point relatedness could take on a new aspect of comparison. Are those around you able to do things better than you? As you gain mastery of yourself and your ability to influence your environment, you become aware of choices that you can make about how you interact with your environment and with the people around you. Now relatedness could incorporate the aspect of influencing. So relatedness runs through the development of the other needs, but it changes its nature as the other needs come online.